Natural, glowing skin has now become easy in one step: introducing NEW Moisture Surge CC Cream Compact Hydrating Colour Corrector SPF 25, Clinique's newest treatment product, perfect for achieving a flawless appearance in a convenient, portable compact. Moisture Surge CC Cream Compact Hydrating Colour Corrector SPF 25 is rich in moisturising agents that comfort dry and thirsty skin upon application to provide all-day moisture. With continued use, it conditions the skin and improves skin's moisture barrier. This new silky formula also incorporates colour correcting technology to achieve naturally radiant and healthy looking skin. Moisture Surge CC Cream Compact Hydrating Colour Corrector SPF 25 has colour correcting optics to visibly correct a range of complexion concerns. Dull, ashy skin appears bright; sallow, yellow skin turns into a peachy glow; and blotchy redness is neutralised. 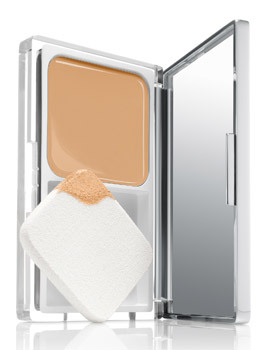 Skin imperfections are immediately corrected for a virtually flawless look, leaving skin with a radiant finish. The formula also incorporates a blend of sunscreens for UVA/UVB protection to protect the skin from environmental assaults for healthy looking skin. Moisture Surge CC Cream Compact Hydrating Colour Corrector SPF 25 is a multi-functional formula with a refreshingly lightweight texture that glides on effortlessly, leaving skin soft, smooth and supple. Available in four shades to match a broad range of skin tones Moisture Surge CC Cream Compact Hydrating Colour Corrector SPF 25 provides moderate coverage for a naturally radiant finish. Colour stays true throughout the day. Appropriate for skin types 1 and 2, the formula is oil-free, non-acnegenic, Dermatologist tested and Ophthalmologist tested.